My wife and I made a big decision this week; a decision we have pondered for the past 5 months, a decision that leaves us vulnerable in some ways, a decision that will teach us what it means to trust God, again. Ever found yourself hanging on a thread of hope? Ever felt vulnerable, despite God’s leading? Ever wondered what God was up to? Vulnerability is not something that comes natural to us. We loathe inconvenience and demand the world revolve around us. But I have news for you, friend – get over yourself. There’s more to life! The best times of our lives are NOT the well-planned, smooth moments. Rather, awesome happens when God interrupts our easy lives and reminds us what it means to wholly depend on Him. 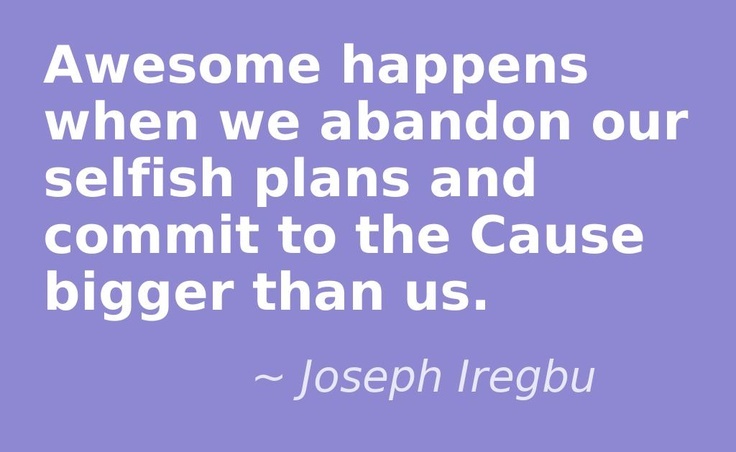 Awesome happens when we abandon our selfish plans and commit to the Cause bigger than us – You can share this. This is not easy but needful. I’m reading START by Jon Acuff and loving it so far. Jon rightly affirms that the secret to living purposefully is to start. There’s a time to dream and a time to work the dream. Awesome happens when you start doing the work that matter, not stalling. Why Are You Afraid To Commit? What’s stopping you NOW. Why are you afraid to commit? What’s God calling you to release? To let go? To free? To abandon? Are you afraid to commit? I can understand. But as we’re currently learning, until you release what you’re holding so tightly, He can’t unleash on you His treasure house. There’s purpose in release and we find it when we respond to the call (“Yes Lord, I’ll do it” or “I’ll go.”) and commit ourselves to the cause. What big decision have you taken recently that called you to trust God in the unknown? Your story will encourage me, please share it. P.S. I’ll be away on a Leadership Conference (with my family, yes, including this beauty) and may not post again this week. Oh, mind praying for us? Remain awesome!